Rupert Murdoch, consolidating his global media empire in the United States, is expected to announce today that he will buy out the shareholders of his Fox properties for about $7 billion, executives involved in the deal said last night. The deal would solidify Mr. Murdoch's control over some of the nation's most valuable media assets like the Fox broadcast network and the DirecTV satellite service and help simplify the complicated structure of his far-flung company, the News Corporation, which includes newspapers, television, film and satellite assets around the globe. It also puts Mr. Murdoch in a better position to leverage his full ownership of the Fox Entertainment Group for future deals. The transaction, which the board of News Corporation approved last night, would also make Mr. Murdoch's company an even more formidable media power in the United States. 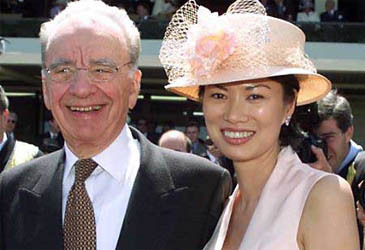 Mr. Murdoch, who gave up his Australian citizenship 19 years ago to become a United States citizen, recently reincorporated News Corporation in the United States and shifted its primary stock listing to the New York Stock Exchange from the Australian exchange. "The move underscores the simplification process: Mr. Murdoch's drive to make News Corporation a simpler and more shareholder-friendly U.S. company," said Mario Gabelli, chief investment officer of Gabelli Asset Management, whose fund owns shares of both News Corporation and Fox Entertainment. The move to bring Fox Entertainment back inside the fold of News Corporation also gives Mr. Murdoch more flexibility to wield his deal-making muscle in the United States, where he used to have to rely on the often faltering stock price of his Fox subsidiary as leverage for deals. "This makes it easier for News Corp. to do deals. It simplifies the structure and gives it full control over the deal making process," said Harold L. Vogel, an entertainment analyst. The timing of the transaction raises questions about the status of Mr. Murdoch's feud with John C. Malone, the chairman of Liberty Media, who raised his company's investment in the News Corporation to 17 percent in November behind the back of Mr. Murdoch, who owns a 30 percent voting stake. 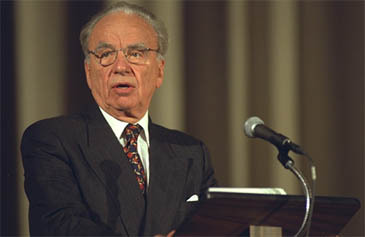 Only a week later, News Corporation introduced a plan to thwart would-be hostile bidders and keep Mr. Murdoch in control of the company, which he plans to turn over to his sons: Lachlan, now deputy chief operating officer, and James, chief executive of British Sky Broadcasting, Mr. Murdoch's satellite TV company in Britain. "The timing is confusing because we had expected Mr. Murdoch to complete a transaction with Mr. Malone before buying in Fox," said Richard Greenfield, a media analyst at Fulcrum Global Partners. A spokesman for News Corporation declined to comment.